Yesterday I posted a picture of a poster that a first grade teacher submitted (click here to see the poster). This poster inspired me to make a series of worksheets that ask students to describe a picture with only the main idea and then using the details. 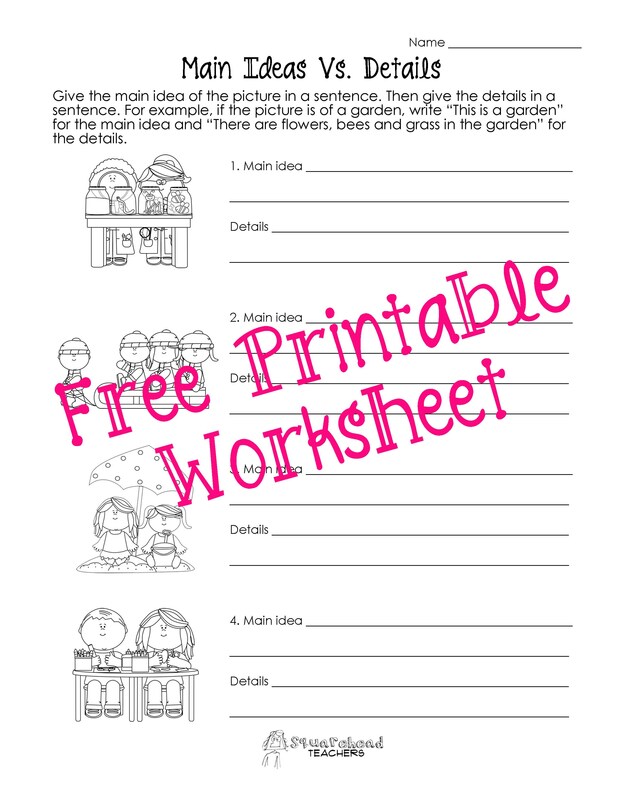 The poster is the example of how to complete the worksheet. This entry was posted in Language Arts, Reading and tagged Children, Education, Elementary School, Homeschool, Kids, language arts, literacy, Reading, Teacher Resources, Teachers, Teaching by Squarehead Teachers. Bookmark the permalink. How do you make the cute little graphics? I have seen them everywhere and want to use them on my own resources as well. Thank you! The Squareheads are made for me by my dad (so they’re obviously my favorite), but most of the other ones are from mycutegraphics.com. They’re licensed for free educator use.